We’re in a major shift in a fundamental aspect of how businesses grow, how buyers purchase, and how businesses build meaningful conversations and customer relationships. Companies who align their mission, strategies, action plans, and tools with the way buyers think, learn, discover, and purchase will have a huge competitive advantage. Organizations need to adjust their mindset and build a strategic foundation to deal with these facts and not just update a business plan. Inbound Organization shows leaders how to build their company's future around Inbound principles and strengthen the structural foundations necessary to deal with the changes in buyer behavior. 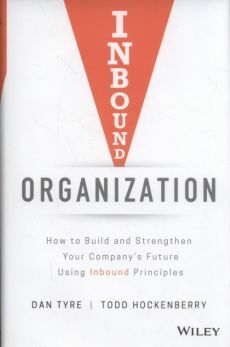 It explains how and why Inbound ideas and how to create a remarkable customer experience belong in the boardrooms and on the desks of founders, entrepreneurs, business leaders, and anyone who has a responsibility to lead their organizations into the future. Stay ahead of the curve and learn how to use Inbound principles to ensure you’re always ahead of the curve.